Then opened He their understanding, that they might understand the Scriptures. — Luke 24:45. 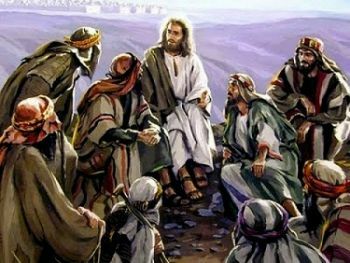 The forty days in which the risen Lord was seen by His disciples were drawing to a close. The feast of Pentecost was near at hand. The Lord had again assembled His disciples, especially the apostles, in Jerusalem. One day, when He appeared to them, He said to them: “These are the words which I spake unto you while I was yet with you, that all things must be fulfilled which were written in the Law of Moses, and in the prophets, and in the psalms concerning Me.” Formerly the disciples had never been able to understand when the Lord Jesus spoke to them of His suffering and death and His resurrection on the third day; and the Scriptures which had foretold these things had been just as obscure to them as Jesus’ words. But now they saw the fulfillment; now they saw the Crucified before them alive; now all was different; now they understood it all. Now He went through all the Scriptures with them; He showed them how everywhere they prophesied concerning Him, and opened their understanding, that they might understand the Scriptures. It was a precious sermon: the risen Lord the Preacher, and the disciples, now so glad, the hearers. He closed this sermon with the words: “Thus it is written, and thus it behooved Christ to suffer, and to rise from the dead the third day; and that repentance and remission of sins should be preached in His name among all nations, beginning at Jerusalem. And ye are witnesses of these things” (Luke 24:44-48). Note well, Christian: not the New Testament only, but the Old Testament as well everywhere testified of Christ, and is a Christ-book. Unless you understand this, you do not understand the Old Testament. Jesus, crucified and risen, of whom the New Testament witnesses, is the Messiah foretold and prefigured in the Old Testament, the Savior of the world. Thus at all times there was but one true faith: the faith of the Christians. All who ever were saved, from the days of Adam, were saved in no other way than by faith in Christ, the crucified and risen Lord. “Neither is there salvation in any other [than Jesus], for there is none other name under heaven given among men whereby we must be saved” (Acts 4:12). PRAYER – Lord Jesus, true Messiah and Christ, the Son of God the Father, only Savior of the world, help me at all times to believe the eternal and unchanging, old and ever new Gospel concerning Thee, which tells me that it was incumbent upon Thee to suffer and to die for my sins and the sins of the whole world, and to rise again the third day because of my justification and eternal blessedness and because of the justification and blessedness of the whole world. Help me, lest I, as so many do, turn away from this Gospel. Grant me grace to continue to cling firmly to this priceless Gospel and continue to be grateful for its sure salvation. Amen. He lives, He lives, who once was dead; He lives my ever-living Head. He lives my hungry soul to feed; He lives to help in time of need. He lives and while He lives I’ll sing; He lives my Prophet, Priest, and King.